The lazy Christmas elf | Help! I live with my Italian mother in law! Bill Gates once said if you want to find the best short cuts give the job to your laziest employee. Coco has already tried to eat it (this cat never stops eating!) and I have tied it to a chair so she won’t try and climb it (yeah like that will stop her) Thankfully, the balls are plastic, good thinking Elora! The only tree Mama puts up scares the crap outta me. She hangs Befana (witches) everywhere and it’s just really creepy. Did I mention that my latest adventure with her involved a cat on fire again? We visited her a few weeks ago and it was her birthday. She lit some candles and Coco jumped up onto the table (I know I’m a bad mom and never disciplined her properly so shoot me okay) right over top of a candle. I screamed and thankfully Coco jumped off. I could smell singed fur but luckily she jumped off before being seriously on fire! This is the second time at Mama’s that Coco has caught fire…and my husband wonders why I can’t sleep when I’m on vacation, ha! 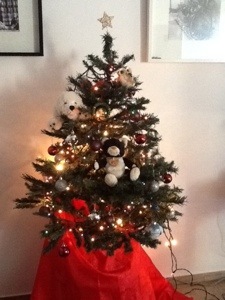 This entry was posted in Cats, Coco, Mama and tagged christmas tree. Bookmark the permalink. Poor Coco, Mama is a danger with those candles! So this Christmas tree is the first in 15 years, really ? That’s great, Leah! Hugs, your posts are always so funny! Nice tree! Has it put you in the Christmas spirit?? ps I want to decorate my blog – how is everyone putting snow on their blogs??? I can’t work out how to do it!! Yes, I am now in the holiday spirit! Nothing like the smell of burnt cat fur to liven everything up! Hahaha. Loved that! Great story, made me laugh lol. DId you get my response to your question on my blog? I have a blog but I don’t really know how to work it lol. Oh for the love of….I obviously fail as a blogger lol. I am actually home on vacation right now so I am not on the Triumph at the moment. However, you will find an amazing group of people there. My favourite HD of all times Damir is there, you will have a great time there over the holidays. What a shame we don’t get to meet up! Haha, I don’t always get this blogging software either but I do think WordPress is a bit easier to use than Blogspot. I was also on TI this summer, in late August. Well enjoy your well deserved vacation and HAPPY BIRTHDAY 🙂 see you at sea sometime, keep in touch!